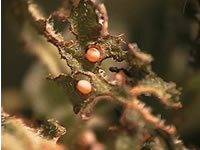 The defoliating beetle Galerucella calmariensis is voracious, prolific, and hardy. Our collection is in mid-to-late May. Later collections may be available from our greenhouse. Call for more info or to inquire about limited numbers of other biocontrols for this persistent weed. Loosestrife defoliating beetle Galerucella calmariensis: Larvae and adults feed on leaves, buds, shoots, and flowers. 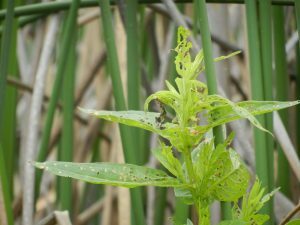 Feeding damage reduces loosestrife growth, flowering, seed production, and photosynthetic capability, negatively impacting overwintering energy, vigor, and native plant competition. Studies cite an impressive ability to relocate to loosestrife up to a kilometer away within a few days of adult emergence. Up to 500 eggs per female and multiple generations per year significantly accelerate establishment and control. 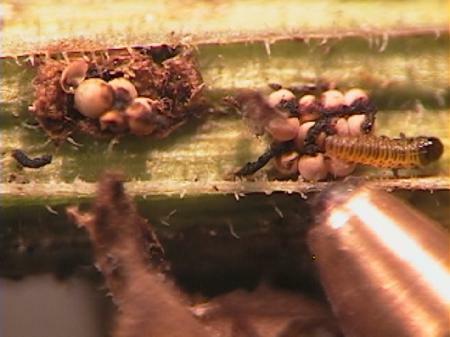 This effective insect is easy to establish and easy to redistribute.